LIGHTNING QUICK Answers from Someone who Cares. I will help you get FAST answers to your toughest questions. Every call earns you FREE MINUTES. I have been a Tarot Reader since 1999. I started by practicing with my friends in high school and found a deep connection to Divinity in the cards. My cards traveled with me to college, where I would practice by giving away free readings in bars. They stayed with me past college, into Seminary, where they've assisted me in counseling, in prayer, in understanding the universe, and in hearing and knowing God. I've read tarot for fairs, stores, and even for corporate events with companies like Microsoft. And now I read for Keen.com, and have been since 2010. Many have commented to me on the helpfulness of my readings and on the guidance they receive from speaking with me; my readings were often exactly what they needed to hear. It is because I don't get in the way of the reading. I tell you honestly and quickly what God says through the tarot. I am a graduate with degrees in Psychology, Religion, and Art; I currently study in the Woolston-Steen Theological Seminary to attain my Masters in Ministry. 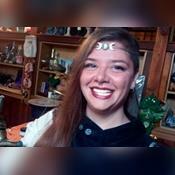 I currently work as a full-time Priestess and Minister, in the mountains of Index, WA. I am a Reiki Practitioner; in addition to Tarot and Counseling, I am available for healings, cleansings, blessings and other forms of remote energy work. With aid from the Tarot, I have a direct line to the Spirits of the Earth and the Heavens. I feel the ley lines of the Earth and our connection to the Universe, and act as a conduit in between the two great energies. It is my desire to use my connection to help you find answers to your questions; to be a torchlight for you on your path. Together, we can find answers to any of your questions. She has been accurate in her readings . Give her a try. We spend our lives questioning and unsure, trying to find the answers to our prayers. Many of us feel like we are alone in this journey. I am here to tell you that Spirit is desperately trying to communicate with you. Spirit knows what you need, and wants to comfort you with messages of love, with revelations that bring understanding. I can help you find understanding, and guide you to see your choices. "'I am a counselor, not a fortune teller. Remember, the future is very fluid, very malleable... Until then, it is yours to create.'" Question Guide: Ask anything. Use this as a guide to help you get started down the road to understanding. What are their intentions for me? Will there be a future for us both? Will there be any promotions or job changes? Is a change to my career a good idea? Should I be working at this company? Is it a good fit? What do they think of my work? What is God/Goddess/Deity/The Universe trying to teach me? Are there messages for me from loved ones who have passed on? Are my goals going to come to fruition? I am trying to make a change in my habits, how can I make this work? I have been a Tarot Reader since 2000. Many have commented to me on the helpfulness of my readings and the guidance they get from speaking with me; my readings were often exactly what they needed to hear. I am a graduate with degrees in Psychology, Religion, and Art; I currently study in the Woolston-Steen Theological Seminary to attain my Masters in Ministry. I am a Priestess, initiated into B.T. Wicca; I have been studying the Mysteries of Eleusis as a Priestess since 2008. I am a Reiki Practitioner; I am available for healings, cleansings, blessings and other forms of remote energy work. Please be kind enough to leave feedback and a rating after your call. This is so that I can help other people too. Consult a medical doctor for questions regarding diagnosing illnesses. Please allow me to read for you, I want to help you find answers today. Miss Cassie has been a user of Keen since 2010. Getting Tarot Readers advice from Miss Cassie through www.keen.com is safe, secure and confidential.